We were walking along the beach from Callantsoog to the south. After 5 km we started walking back. This time I started walking at the high tide mark and collected garbage (Mainly plastic) and throwing it in special wooden boxes on the beach (a project to keep the sea /beach clean). And soon my wife and children did the same. After 1,5 km my eye fell upon a little glass bottle with a strange content. My Daughter picked it up and we saw it contained a paper with French writing. We were very enthusiastic and started thinking what the message could be. Maybe we would get a castle in France??? We continued collecting garbage and came back to Callantsoog. And drove to our vacation apartment. There we opened the bottle. The papers were wet but good readable we could dry them on the heater. Well no castle, but we cleaned a few km of beach and also your garden!! If you look closely in the picture above you might be able to read my letter and see what they are referring to here: The bottle contained bits and bobs that I found while searching through our garden (still at the old rented house). I like to do that from time to time. I have here a selection of glasses on my shelf with rusted nails, snail shells, stones, bits of stones and shards, feathers, … yielding a somewhat strange collection of odd tiny things. 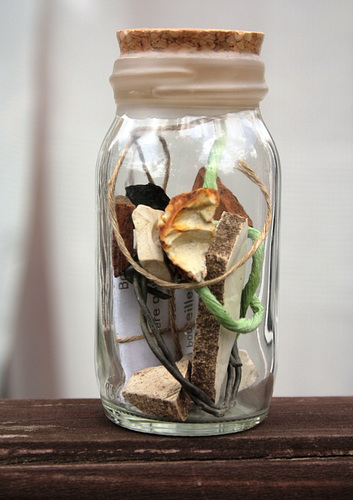 – Well, and on one day, I decided to put the items into a bottle and post them instead of keeping it in my studio. I didn’t have high hopes for the bottle to get found because it looked so much like trash. And thus I thought that maybe I better should not throw it into the see, where – not being found – it might end up as trash. But on the 29th of December, on the ferry from Ijmuiden (Amsterdam) to Newcastle, I shrugged off my doubts and threw the bottle over board. And all is well in the end: the bottle did get found, and provided entertainment, a sense of adventure, and a connection. – It ended up being all I wanted it to be. I hope the finder thinks the same! I was delighted to read that they took a liking in my fish prints, some of which are featured here on the blog, and his daughter ended up making a coloured and absolutely stunning version of one of them. – Really amazing. So thanks over to the Netherlands for sharing your story and pictures, it was a pleasure! May our ways cross again some time! 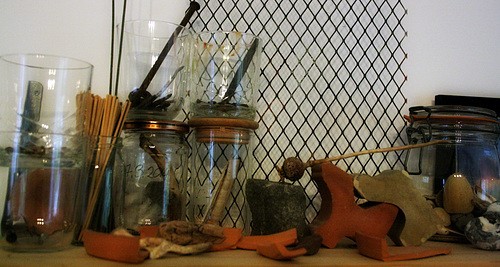 shelf in my studio, showing some of my collected items. – Mostly rusty nails.